Mirror symmetry predicts surprising geometric correspondences between distinct families of algebraic varieties. In some cases, these correspondences have arithmetic consequences. Among the arithmetic correspondences predicted by mirror symmetry are correspondences between point counts over finite fields, and more generally between factors of their Zeta functions. In particular, we will discuss our results on a common factor for Zeta functions of alternate families of invertible polynomials. We will also explore closed formulas for the point counts for our alternate mirror families of K3 surfaces and their relation to their Picard–Fuchs equations. Finally, we will discuss how all of this relates to hypergeometric motives. This report summarizes work from two papers. The authors heartily thank Xenia de la Ossa for her input and many discussions about this project. They thank Simon Judes for sharing his expertise, Frits Beukers for numerous helpful discussions, and Edgar Costa for sharing his code for computing zeta functions. 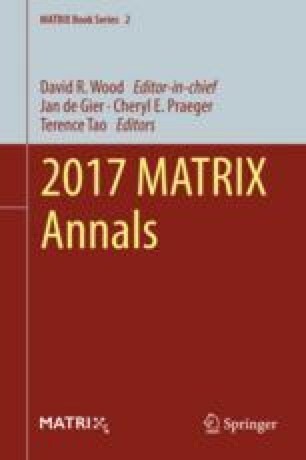 The authors would like to thank the American Institute of Mathematics and its SQuaRE program, the Banff International Research Station, SageMath, and the MATRIX Institute for facilitating their work together. Kelly acknowledges that this material is based upon work supported by the NSF under Award No. DMS-1401446 and the EPSRC under EP/N004922/1. Voight was supported by an NSF CAREER Award (DMS-1151047).